This is Jake from the blue brothers. Mom was going to get a new picture putting the Yoda ears on Amaryllis, but the ears are no where to be found.... weird right?? Jake is looking super cool and like a Jedi! Wow Jake what a cute dude you are. What could have happened to those ears, we wonder?? 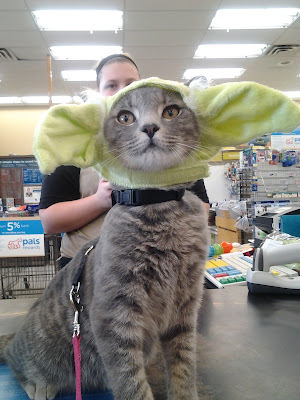 A perfect doppelganger for Yoda! Jake, looking good. Those are some mighty fancy ears. Good boy to let them get on your head. We think some kitty found those ears and put them some place never to be found again.